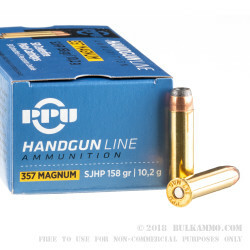 This 357 Mag cartridge’s 158 grain bullet is relatively soft, making it ricochet significantly less while shooting steel targets. That it is a semi-jacketed hollow point makes it suitable for self-defense as well. 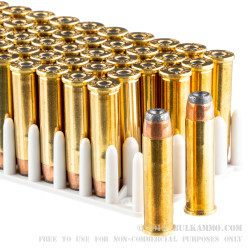 The semi-jacket serves to provide the penetrative power that a full metal jacket would, but without dampening the expansive capability of its hollow point. That along with a muzzle velocity of 1,607 fps will give this round the oomph it needs to cause substantial damage after impact, making it a fine choice if you carry a 357 for personal protection. This cartridge additionally offers a brass casing with non-corrosive propellant and a Boxer primer, so it performs clean and can be reloaded. It is manufactured by Prvi Partizan in Užice, Serbia, a company which has produced ammunition since its foundation in 1928 and served as the United States’ third biggest ammunition supplier in 2016. I have used over half of the 500 ordered. clean shooting and hard hitting.